Double Sided Sticky Construction - Your Photos will Stay in Place! When you leave the room you grew up in, you will undoubtedly take a look back and notice years of memories clinging to your walls. Photos of the great times that were had with family and friends, posters of your childhood heroes, or even the chart you hung above your bed to help you study when you were too tired to sit up straight. These are the things that make a room your own. When you get to college, one of the first things on your dorm checklist should be to make it feel like home. 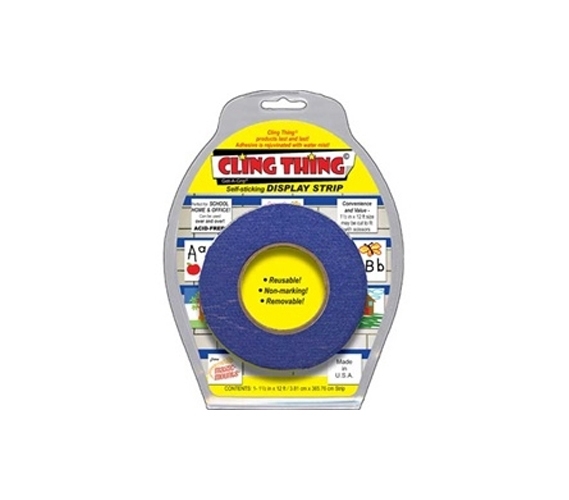 The best way to do that is by using the Cling Thing Display Strip! It will easily hang your college posters, pictures, and other dorm decor, and in blue, it will add a much-needed pop of color. Since you will want to be careful not to damage the walls of your new residence, the Cling Thing Display Strip has a double sided construction that will never damage your walls and won't leave a sticky residue. Just place the double sided strip where you want to decorate your dorm and then pull the top layer back to reveal the sticky strip on which you can place your dorm room wall decor. However, there are many uses and dorm decorating ideas besides the wall! Try placing it on the top shelf of your dorm bookshelf or the edges of your college desk - anywhere your mementos will be in full view - making your dorm room not just another space to sleep, but another place to live.